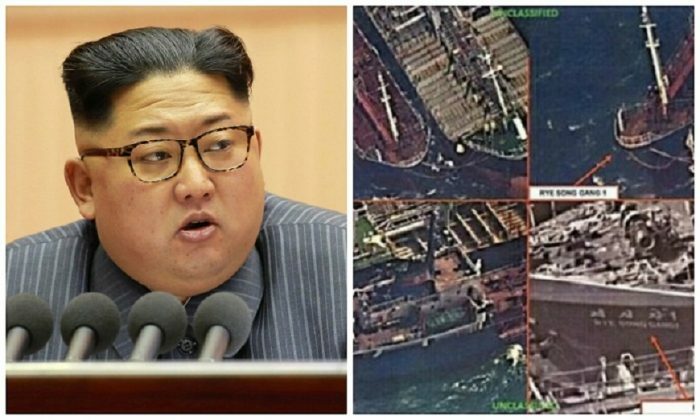 Chinese ships have been illegally transferring oil to North Korean vessels on the West Sea, according to imagery from U.S. reconnaissance satellites. The action violates U.N. restrictions on oil sales aimed at clipping the nuclear ambitions of the rogue state. U.S. reconnaissance satellites spotted the high-sea transfers around 30 times since October, reported South Korean newspaper Chosun IIlbo. The illegal trades occurred closer to China than South Korea, according to a South Korean government source cited in the report. “We need to focus on the fact that the illicit trade started after a U.N. Security Council resolution in September drastically capped North Korea’s imports of refined petroleum products,” said the source. Following pressure from U.S. president Donald Trump, the U.N. decided on oil trading restrictions as part of an attempt to reign in the North Korean regime’s nuclear missile program, following a series of missile tests accompanied by the ratcheting up of war-like rhetoric and threats. The sanctions also bar North Korea from importing natural gas. Last month, the U.S. Treasury Department placed six North Korean shipping and trading companies and 20 of their ships on a sanctions list. “North Korea is known to employ deceptive shipping practices, including ship-to-ship transfers, a practice prohibited by United Nations Security Council Resolution (UNSCR) 2375 of Sept. 11, 2017,” said a statement from the treasury. The Chosun IIlbo report notes that oil embargos imposed on the North are pointless if such illegal smuggling with Chinese ships continues. China is North Korea’s number one trading partner and officially claims it is adhering to U.N. sanctions. In a recent report, China claimed its export data showed none of its oil products were exported to North Korea in November. The U.N. Security Council imposed new sanctions on North Korea on Friday in response to its recent intercontinental ballistic missile test. Part of the U.S.-drafted resolution seeks to ban nearly 90 percent of refined petroleum exports to North Korea by capping them at 500,000 barrels a year. The resolution also caps crude oil supplies to North Korea at 4 million barrels a year and commits the council to further reductions if it were to conduct another nuclear test or launch another ICBM. On Tuesday, the U.S. Treasury Department placed sanctions on two high-ranking North Korean officials involved in the regime’s nuclear missile program. Tensions have been rising this year over North Korea’s nuclear and missile programs, which it pursues in defiance of years of U.N. Security Council resolutions. North Korea claims its nuclear weapons are a self-defensive deterrence not in contradiction of international law. Additional reporting by Tom Ozimek.